"My kids love this because they can create their own packets. They like rice in it but 1/3 cup water in each packet is needed to get it to cook. 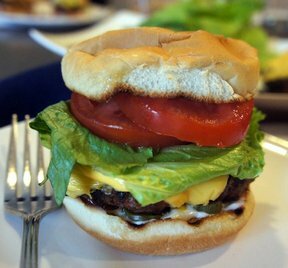 I put a 1/2 slice of bacon under the hamburger to keep the bottom of the burger from burning and it added extra flavor, along with a half of a packet of dry onion soup mix mixed into the burger." "Delicious! 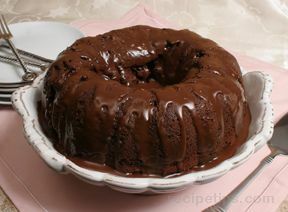 Not to mention a piece of cake - I used the crock pot. Was perfect on a crusty roll with fresh tomato slice. 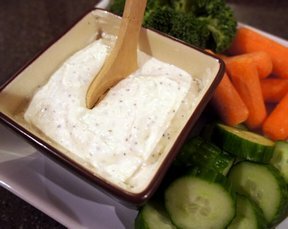 I mixed some sour cream and horseraddish to spread on the roll." "I only used 1 box of noodles and this was more than plenty. I used crushed tomatoes instead of roma tomatoes to cut down on some prep time. 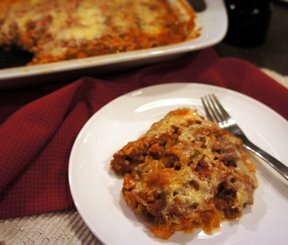 Leftovers are even better - my husband only had the leftovers and he said it was the best lasagna he'd ever had." 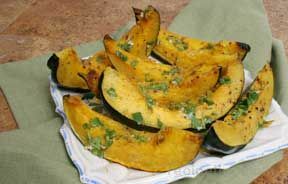 "I normally cook squash with brown sugar to sweeten it. This was a nice change to make it more savory than sweet." 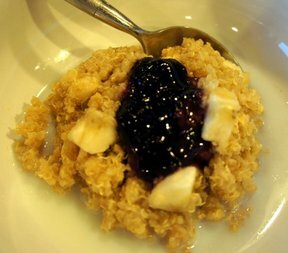 "Such a simple recipe yet so delicious. I always remove the skin because it never seems to get done and when it's removed, the exterior meat kindof creates it's own "skin" when baked. Perfect for my daughter's birthday." "Delicious! This is a favorite for me. Perfect amount of everything in the sauce. 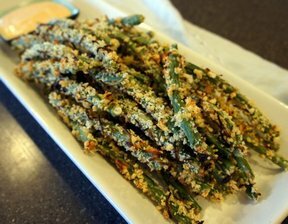 It just adds a little something extra to the roasted asparagus." 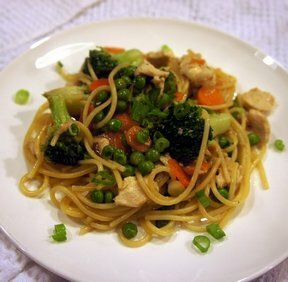 "Simple stir fry that everyone will love. Cut back on the OJ if you don't want it too citrusy. 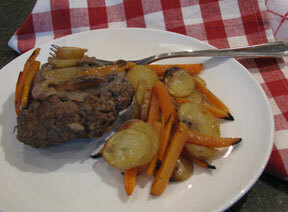 I omitted the pineapple for the kids and it was still delicious." "Perfection. 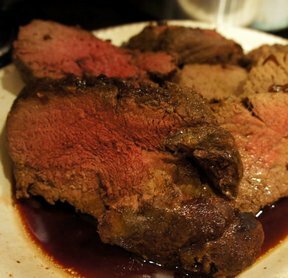 I made this for Christmas Eve, followed the recipe to the letter, and it was perfectly medium rare. 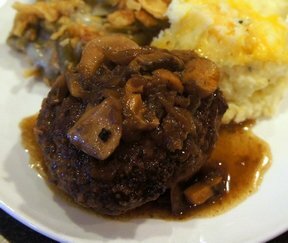 The flavor was sensational, especially the mushrooms!" "These may not be the prettiest, but they sure are delicious. 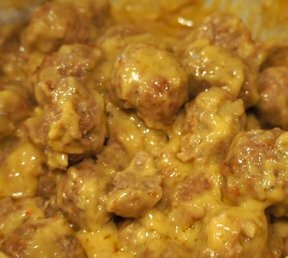 I am not usually a frozen meatball fan, but this sauce was really good over them." "I made a few slight changes. 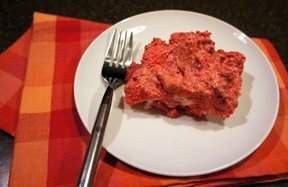 I used ground turkey and instead of cottage cheese, which I didn't have, I used cream cheese. It was still delicious! 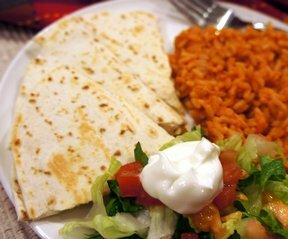 The girls thought the tortillas, being a little moist, were the best part." "Delicious! I couldn't believe how easy it was! I used Mrs. Buttersworth syrup. I'm going to bring this to Thanksgiving this year since it's going to be so cold." 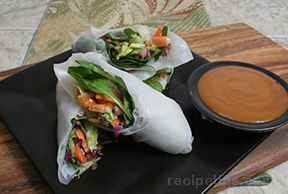 "I can't believe this was SO easy and SO tasty! I really think this might be better than my mom's and that is something. 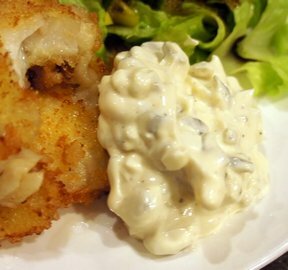 Who would have thought hard-boiled egg in tartar sauce?" 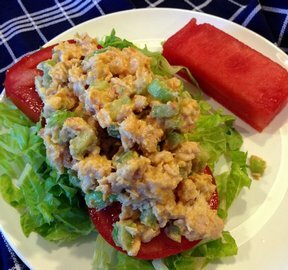 "I used roasted red pepper hummus and loved this salad. 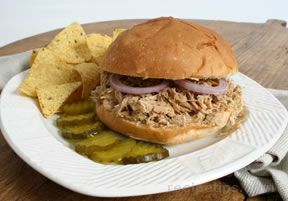 A great lunch if you like tuna and want something a little different. No dressing necessary!" "This was amazingly delicious! I used rotisserie chicken and bypassed the walnuts (I am not a fan). I didn't even dress it with anything and loved it! 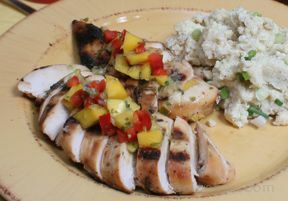 The sweet fruit and moist chicken were great together." "I liked the flavor but it didn't get crispy, like I would expect from "pizza crust". 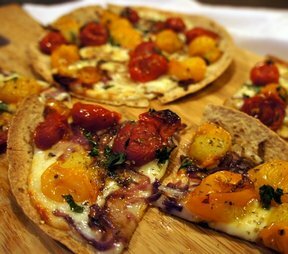 I topped it with roasted vegetables, which I loved, but missed that crispy crunch." "Delicious! The sauce was thin, but the meat was full of flavor from it. I seasoned it with Montreal steak seasoning." "I thought these were delicious! 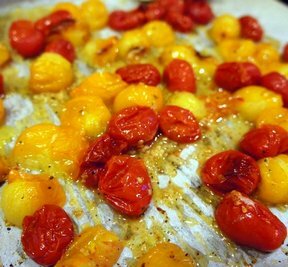 I used whole wheat pitas and did roast the whole cherry tomatoes first. Amazing flavor! 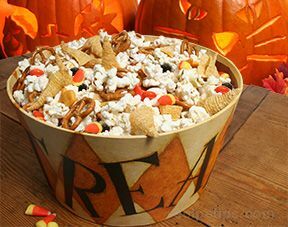 So easy to make and even my kids loved it." "I loved this salad. 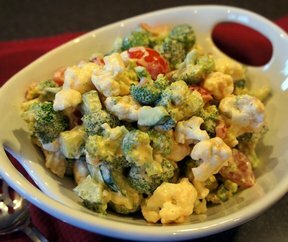 I liked t there wasn't any mayonnaise in it so it wouldn't spoil since I was bringing it to a potluck." 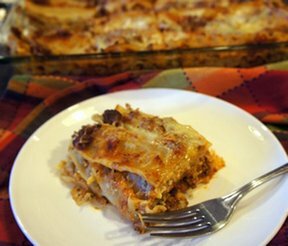 "I doubled the recipe and made in a large lasagna pan. I baked it for 1 hour covered and 30 minutes uncovered. It was delicious! I will make this again, it was so easy to make." "These were great. I used medium taco sauce instead of the enchilada sauce just because I didn't have any. And I made it up in the afternoon and refrigerated until supper time. Delicious flavor!" "I used the caramel bits you can buy now and it worked perfectly. 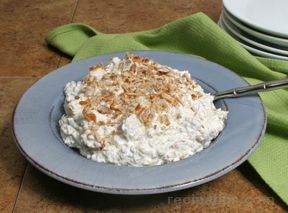 Quite a bit of work to make and it was tasty, but not sure it's any better than that simple snicker salad." "Bringing this on a weekend with the girls. 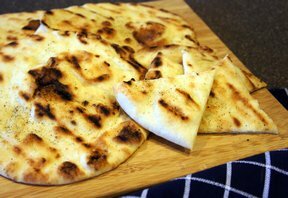 I couldn't stop eating it last night when it was hot out of the oven!" 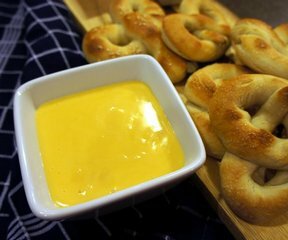 "Pretty tasty sauce and SO SO easy! 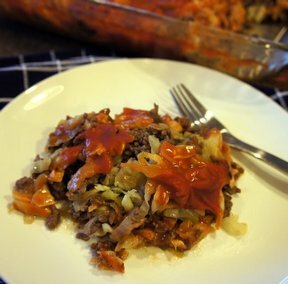 I browned the ground beef with the onion the night before and then put everything in a slow cooker the next morning. It cooked all day and was ready when I got home from work. 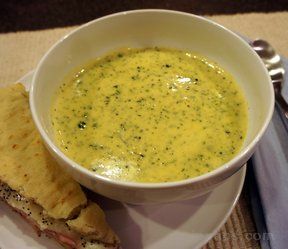 I also doubled it and ended up adding a little more basil, otherwise followed the recipe." 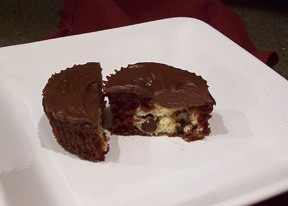 "My family thought the chocolate layer was a little too thick, but they loved the peanut butter layer! 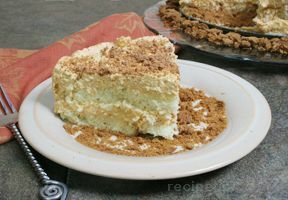 Be sure to pulse the graham cracker crumbs very fine, so you get the right texture." "I halved this recipe. Not a favorite. Maybe fresh broccoli would be better as it got a little watery. And some seasonings would add alot, too." 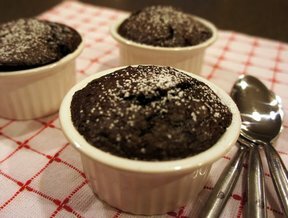 "Light and airy, almost like a souffle. My kids didn't like them as well because of them being so light but I did! 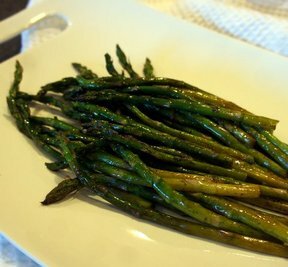 I will add a little asparagus with ham instead of sausage next time." "Sticky and messy but OH-SO-GOOD! 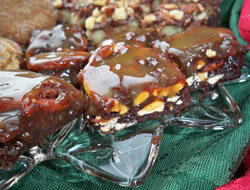 The brownie was moist and the caramel, well, its caramel topped with a little sea salt to make the flavor come out a little bit more. These are a must try." "AMAZING! These were delicious. I liked them with ketchup and top-the-tator, but they are great on their own, too. 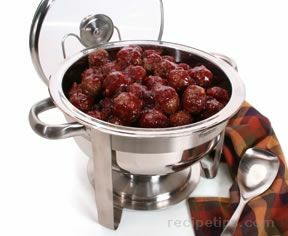 Great for entertaining, because they are pretty!" "Great cookie. 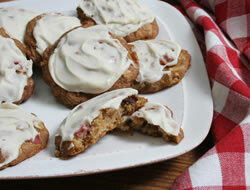 My kids weren't a huge fan once the raspberry jam was added, but they LOVED the cookie part." "Made this but did it a little differently. I didn't use the bacon drippings. Mixed up the dressing and refrigerated everything separately until ready to serve the next day. It was delicious!" "Fun recipe! We made these last night and the kids help make there own shapes. We had pumpkins, swans and letters! I think I would lower the temp to 425 next time though." "Brought this to a party over the weekend and there wasn't any left...I think that's a good sign! It would be a great spread for a sandwich, too." 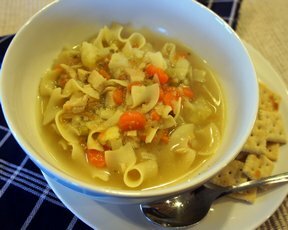 "My family LOVED this soup! It was actually pretty easy to make, once all the slicing and dicing was done." "I got this from my sister and it really was good! I ALWAYS use Chichi's taco seasoning. There wasn't any leftover :("
"ilovecupquake: Yes, I would definitely make it! 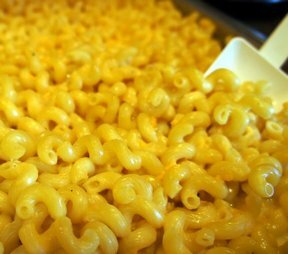 The Velveeta makes it creamy but the cheddar gives it great cheddar flavor. You won't be disappointed." "My only complaint is that it wasn't quite saucy enough for me. I would use 1 1/2 jars of spaghetti sauce next time. Very tasty lasagna though." 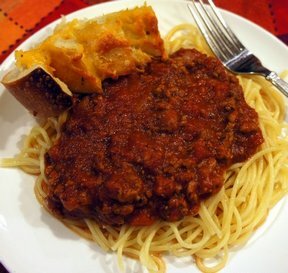 "I liked the flavor of the meat and the sauce alot. 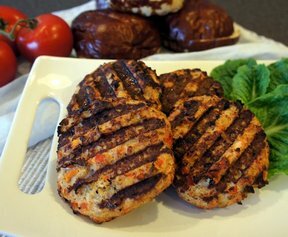 The patties were soft and tender. 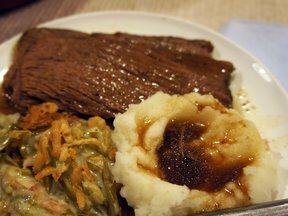 I served it with ranch mashed potatoes and green bean casserole!" "This was delicious. I did make some changes since I had some leftover rice that was already cooked. I baked it uncovered for 40 minutes. It was delicious! 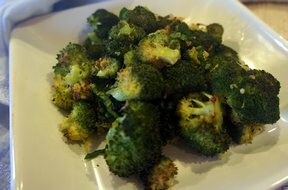 Kids loved it, even the broccoli." "Thinner than I they should have been. 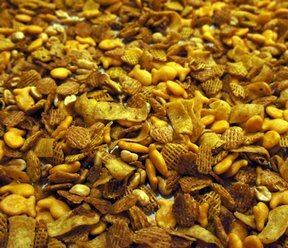 They had good flavor but got pretty crisp since they were so thin." "My favorite dessert. 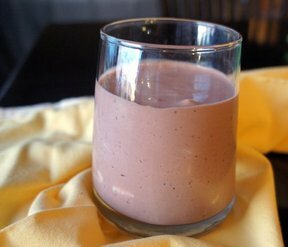 I like it best with raspberries, but you can make it with strawberries, too. I made this as a birthday treat for me. Light and delicious." 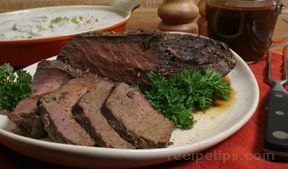 "I used everything except the liquid smoke, since I didn't have any. 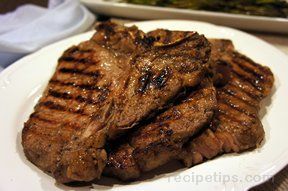 Great on the New York strip steaks I used." 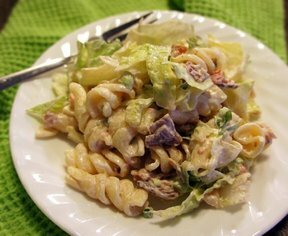 "Nice and creamy salad. I used Western dressing and apple cider vinegar." 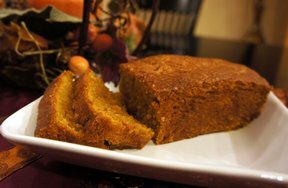 "This was really good, especially the stuffing! 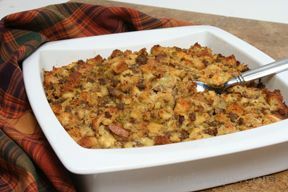 I have never had spinach or prosciutto in my stuffing and now I will never have it without! Yum! 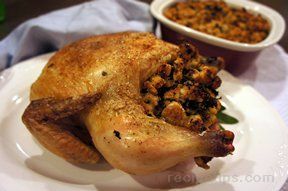 I did oil up the chicken and rubbed some of the same seasonings in the stuffing under the skin." "Delicious! My kids even loved it. This was my first crack at tomatillos and I was surprised at how tasty it was. 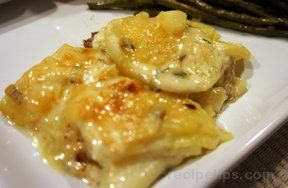 Perfect with the creamy stuffed pasta shells." "I made this up for a weekend at the lake. It was perfect to have on the boat for a snack. I sent one of the bags with the kids to their grandma's and they ate it all up, too. 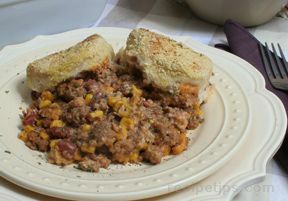 This makes a ton and I halved it, and there is still a bag in my freezer!" "My girls loved these! 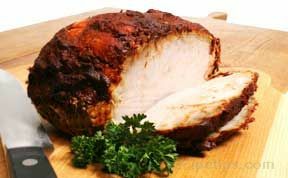 The outside got crispy, just like it still had the skin and the inside was moist and tender. 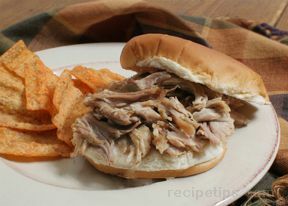 Perfect either hot off the grill or to bring on a picnic and eat cold." "Ooh! It's been a long time since I have had this. My neighbor makes this and it is SO good. I'm going to have to try this myself but without the avocado...not a fan." 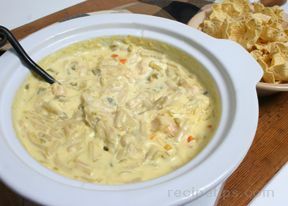 "This is my mother-in-laws recipe and it is to die for. It looks so simple, but it must be something with the combination of flavors that makes it so tasty. 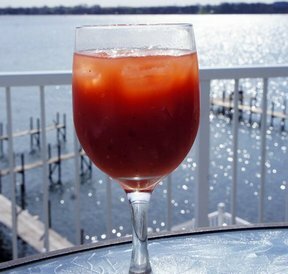 I am going to make this for an appetizer at the lake next weekend." "Kindof dry and not much flavor. I don't recommend." 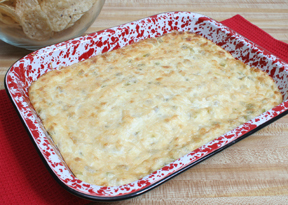 "I halved this recipe and baked it in a 9x13 inch pan. They are REALLY moist! I did have to cook them longer than 30 minutes, more like 38, but could be something to do with the pan change. 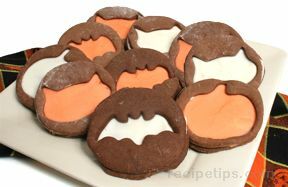 These are delicious the way they are and don't need any frosting!" 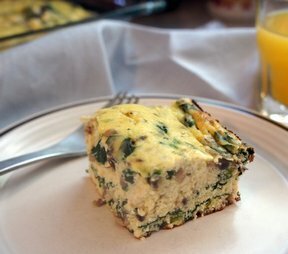 "I used fresh spinach and sauteed it in a little bit of butter. I also sauteed the chopped mushrooms a little, too. I doubled it and baked it in a 9x13 inch baking dish. Delicious!" 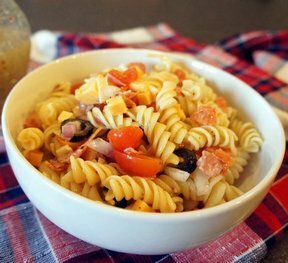 "I used a greek oil and vinegar dressing and threw some Kalamata olives in it. Delicious!" 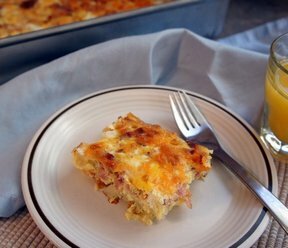 "I baked the hashbrowns the night before along with using precooked bacon and it turned out great. Just had to assemble in the morning. It was a little thinner than I expected, but still tasty." 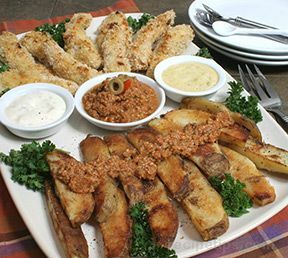 "Perfect with the Crispy Baked Green Bean Fries! We have a little leftover so I am going to put it on my turkey sandwich for lunch." 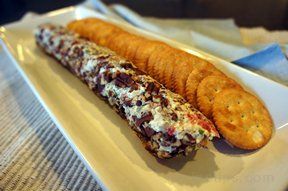 "We had these at a restaurant at the lake so I was excited to try them. Since they were baked they weren't quite as good but I must say if you add in the calorie savings, they would certainly be close! 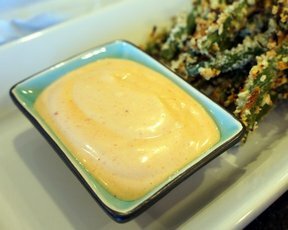 Definitely make the Spicy Srirachi Mayo to dip them in." 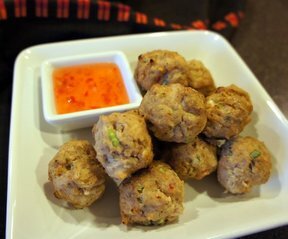 "I made these last night with ground chicken. 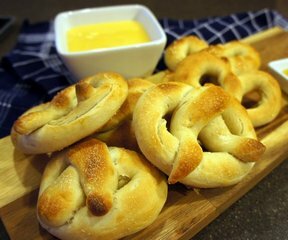 My girls ate them up on pretzel buns and I thought they were delicious with mustard! I had never used Old Bay on burgers before and it was really good. 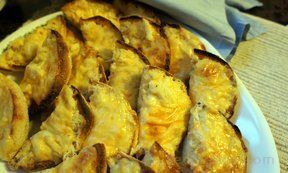 My husband liked it with pepper jack cheese." Comment: This sounds like the perfect addition to our family weekend at the lake. Kids can have their own "Mimosas" as the adults enjoy the original ones. "Ooh, I ran across these and remembered how good these were! I made them to for a holiday party this year and they were a hit. 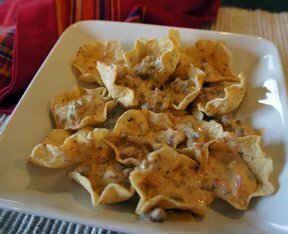 I think I will make these for a Friday night appetizer." 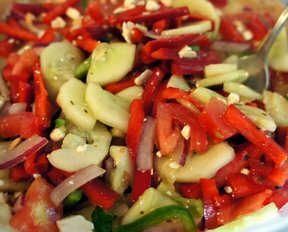 "This is one of my favorite salad recipes! I always roast the nuts and noodles in a pan, but using the oven was so much easier. I forgot the spray them and it still turned out. 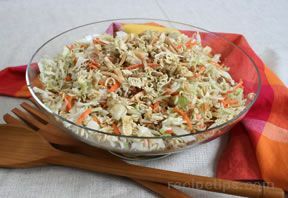 Now if I could just keep my husband out of the crunchy topping so there's some for the salad :)"
"Just what I was looking for on a hot and humid night where there will be no cooking. I always have hard-boiled eggs on hand and everything else was in the fridge. 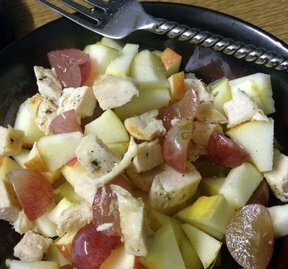 My husband likes Western dressing, the kids like Ranch and I used Balsamic Vinaigrette." "Good flavor but needed quite a bit more salt and pepper. 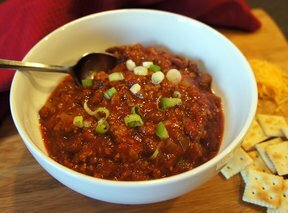 I substituted 1 can of diced tomatoes for the water since I like tomato chunks in my sloppy joes." 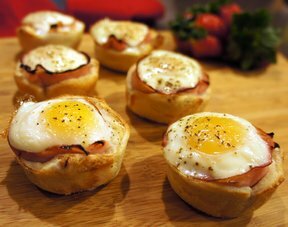 "These were really good! A co-worker brought them in to work and everyone wanted the recipe. I liked the cranberries with the rhubarb. 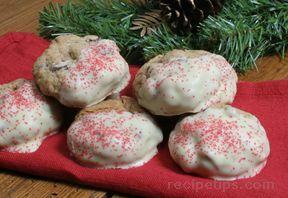 I will go a little easier on the frosting since the cookie was so tasty, didn't need so much sweet frosting." 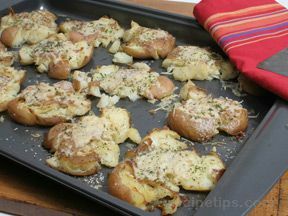 "I see alot of garlic bread recipes with mayo and have always been scared to try them. I finally did and will definitely make again. 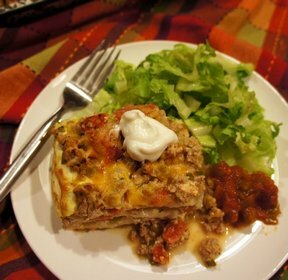 This was delicious and all my guests liked it, too." "Melted in my mouth! I couldn't keep up with my 7-year old as she ate these. 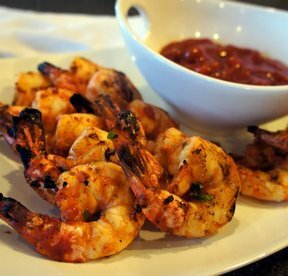 We served them on grilled filets but could have eaten them just as a snack!" 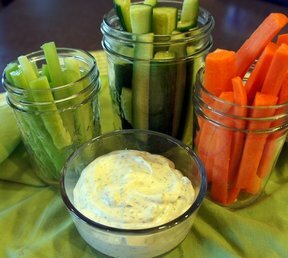 "Easy homemade vegetable dip. 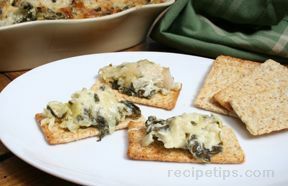 Kids like it with crackers as an after school snack." "Once the raspberry jam was stirred in, I liked it much better. My husband didn't care for it though, thought it was too bland even with the PB&J." "Delicious! I added 2 cloves of garlic and used Italian seasoning instead of the fresh herbs just because I didn't have any. My only complaint is that the zucchini was a little firmer than I thought it should be but I think I could just cook it longer. Next time I will be trying on the grill." "No more peaches and cottage cheese for me! I enjoyed this fresh salad. 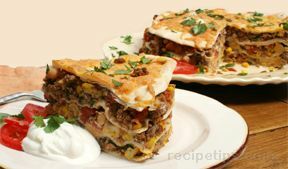 Really loved the tomatoes with the pepper and cottage cheese." 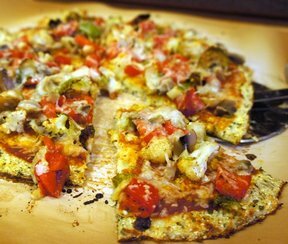 "Loved this pizza! I topped it with fresh tomatoes and black pepper. Next time a little balsamic will be great drizzled over it." 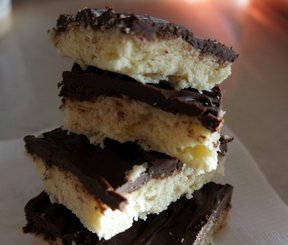 "A shortbread like crust topped off with a thick chocolate frosting. I really did have everything in my pantry! Perfect for unexpected guests." 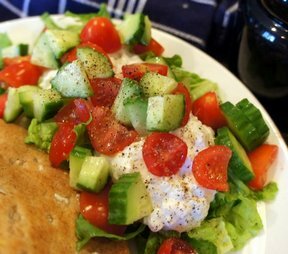 "Great breakfast and perfect for the Spring. 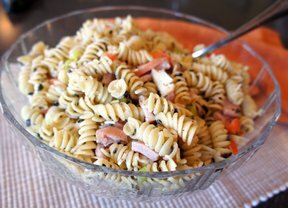 I loved the ham and red pepper in this." "My husband and I liked these more than we thought we would. 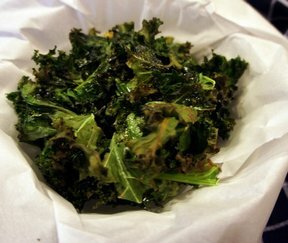 We seasoned with sea salt and pepper and baked on a rack so they were extra crispy. Be sure to cut out the stems because they are bitter." "I had this for a light supper last night. Probably not for kids, mine wouldn't even try it, but I thought it was delicious. Be careful not to use too much vinegar - overpowers in a hurry. 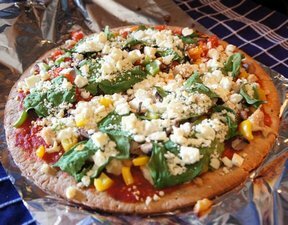 I think goat cheese would also be great on this instead of the cream cheese." "Delicious! 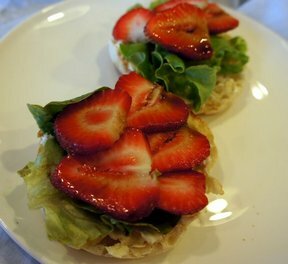 I make these and put them on top of my salads for lunch." "Made this for my daughter's birthday party and it was delicious. 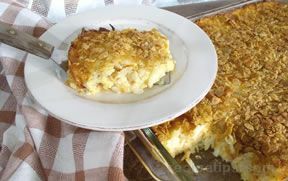 I haven't had much luch with homemade macaroni and cheese so this one I will have to keep around because everyone loved it." 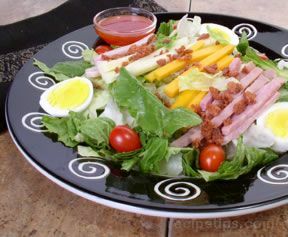 "The perfect salad to serve beside grilled chicken! This was a great start to Spring." "I loved these! 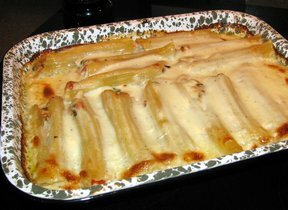 Served these when I had people over and everybody loved them. I actually grilled them and refrigerated until the guests arrived. They were treat served cold!" 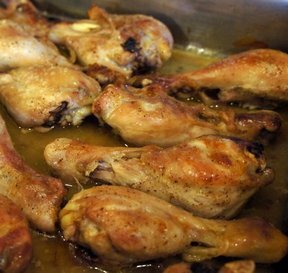 "Very tasty chicken drumsticks! My family loves drumsticks and I made these for my daughter's First Communion. I grilled them the night before and then baked them in our convection oven covered while we were in church, about an hour and a half. 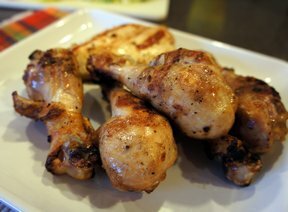 I served the sauce beside the chicken and I think most people didn't even use the sauce and loved them anyway." "The more I ate this the more I liked it. Definitely different from cream of cauliflower. 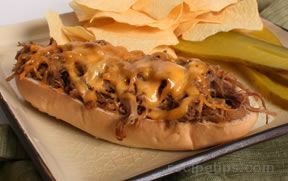 I sprinkled with a little cheddar and the kids liked it." 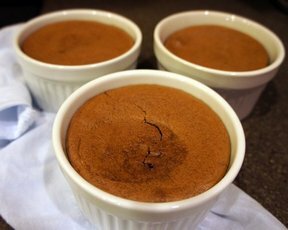 "I used granulated sugar instead of powdered sugar but it was still delicious! 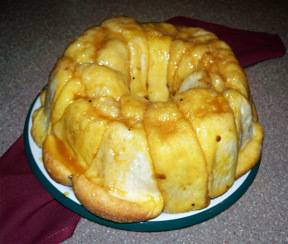 I may have undercooked it since it was a little too melty inside, but I heard NO complaints!" "Makde this for my daughters birthday breakfast. Good flavor." 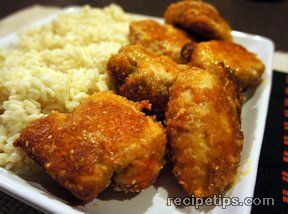 "These were OK. Definitely need the extra chili sauce to dip them in. 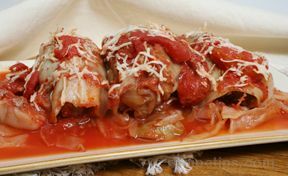 Might be even better if they were simmered in the sauce a little bit." 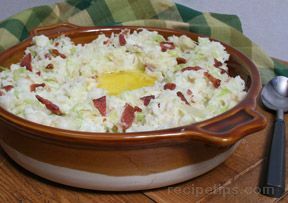 "The perfect side dish for any meal. I roast vegetables alot. 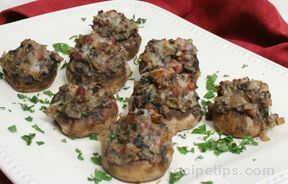 Mushrooms and red onion are a must! 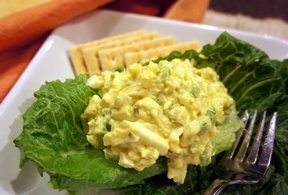 If there is an leftover, they are great on a salad the next day." 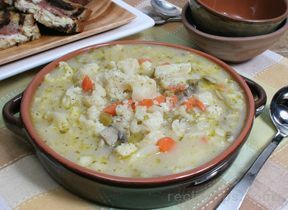 "Great casserole with some salt and pepper. I made this the night before and then refrigerated until the next evening. 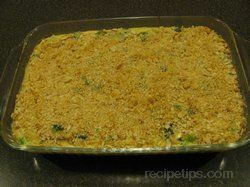 I let it sit at room temperature for 20 minutes before baking as I usually do with refrigerated casseroles." "A sticky sweet treat that is easy to freeze. 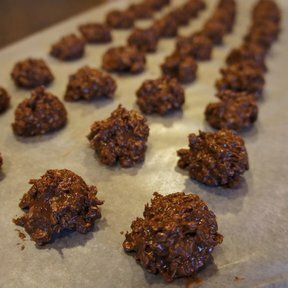 My kids liked them as well as our normal no-bake chocolate cookes. 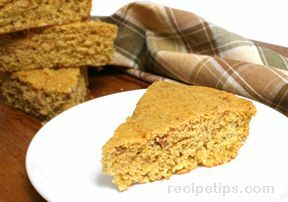 Little did they know, they had flaxseed in them :)"
"I loved this dish! It really was easy to prepare. I had my daughter flatten the chicken in a ziploc bag with a rolling pin. 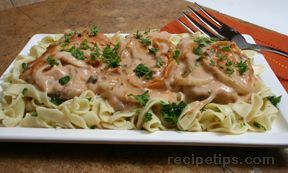 One great addition would be a pan sauce from the drippings when the chicken was browned. 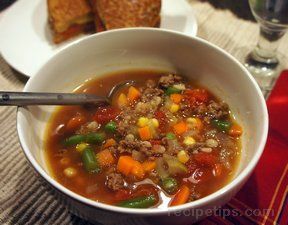 I will try that next time with a little broth, cornstarch and seasonings." 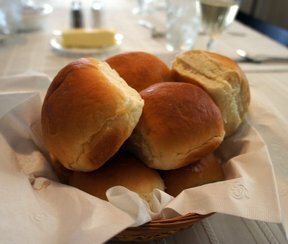 "Perfect dinner rolls. They are better if they haven't been frozen, but are still way better than the store-bought ones." 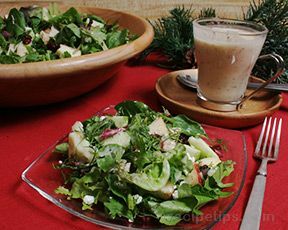 "I'm a huge balsamic vinaigrette fan and this dressing might even be better! I loved everything about this salad. Perfect next to our spaghetti last night." "I loved this. I had to season a little more with s&p, but other than that it was perfect. 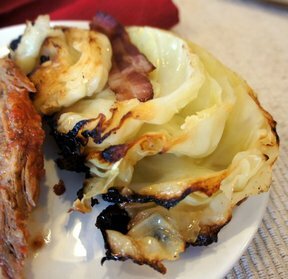 The slightly grilled flavor came through and was delicious with the cabbage." 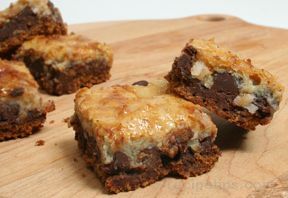 "Don't over bake these so you get that gooey molten fudge in the middle. 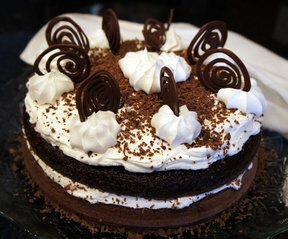 The batter was delicious and the cakes even better." "DELICIOUS! 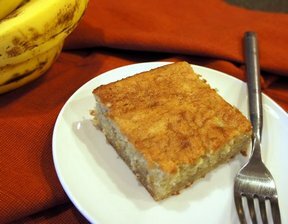 I never would have thought these would top banana bread! 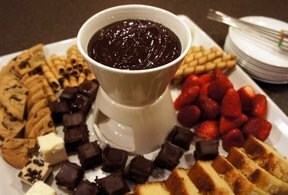 My daughter was licking up the glaze drippings off the counter :)"
"I was in charge of making dessert for New Year's and ran out of time. Ended up buying all the dippers at the store and whipped this up in no time. Kids LOVED it! 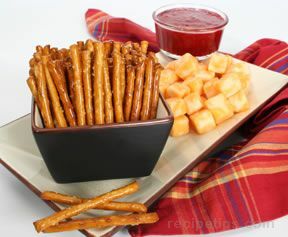 The favorite dipper was cheesecake bites!" 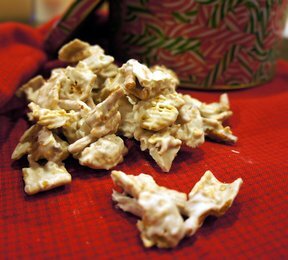 "I melted the almond bark in the slow cooker on low for 1 1/2 hours. Then I mixed it all up in the large slow cooker. It was delicious. I left out the nuts and marshmallows." "Yum! We made these at a holiday cookie swap. We crushed up the peanuts so they would coat every bit of the caramel. Be careful not to get the nougat too big as it gets a little too sweet." 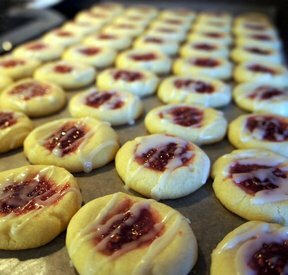 "The dough was the perfect consistency for the cookie press. 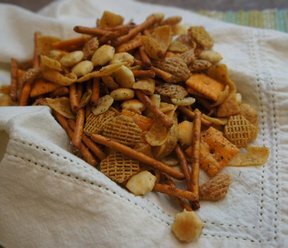 I like it with even more almond flavor, so I will add more almond extract next time." 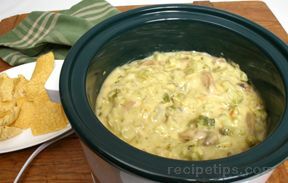 "This is always requested by my kids when we have leftover chicken. 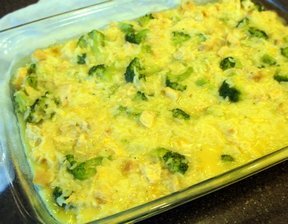 I don't mix the chicken, cheese and veggies together since they like these without the onions and peppers." "I could have eaten the entire cake. You could tell it was sinful since it was so moist, but the cake still tasted light. I'm sure after eating the whole thing, I would have felt differently :)"
"I grilled this and added some sage with the herbs. Pancetta is hard to find so I used bacon. It was delicious! 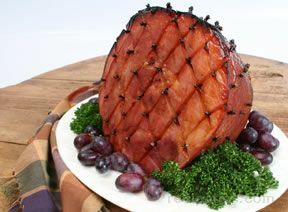 Be sure to let it rest for at least 10 minutes before cutting the let the juices settle in the meat - it'll keep it moist." 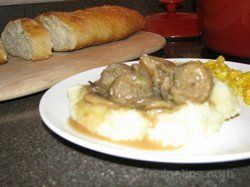 "I used the leftover meat and juice from the 'Italian Beef Au Jus' recipe - it was delicious!" "I made this for the football game. 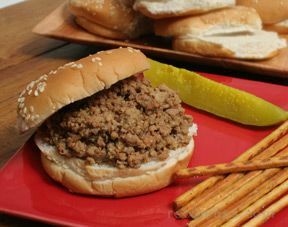 I served it on crusty buns and everyone loved it. 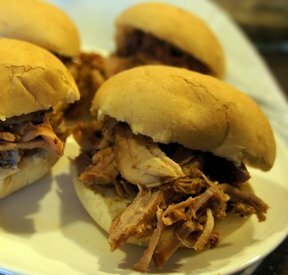 French dips made super simple." 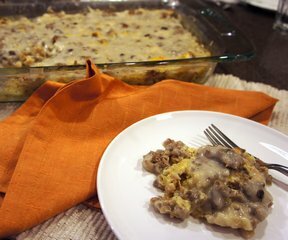 "Delicious casserole! Served it with buttered bread and a salad. I can't wait for the leftovers for lunch today." 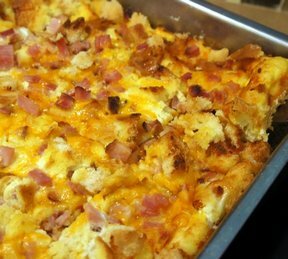 "Good egg bake recipe. I love the cream of mushroom soup with the sausage." "Perfect and simple. Great breakfast for the kids before going off the school. One of my daughters added a little cheese on top of hers." "A little sweeter than I like, but my husband loved it. 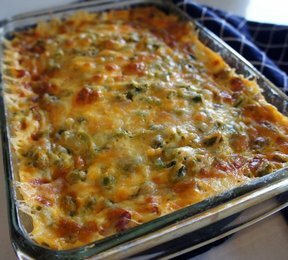 I just topped mine with finely diced jalapenos and it made us both happy." "I baked 6 mini loaves. A couple of them didn't even make it through the 20 minutes of "rest" time! 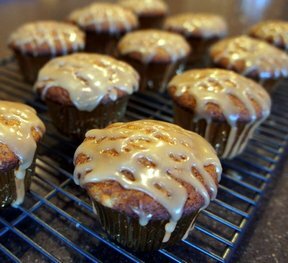 These were SO moist and delicious." "I could have eaten the whole bowl myself. 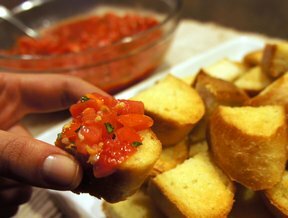 Bread was toasted yet soft in the middle, topped off with fresh tomatoes, garlic and basil...perfect." "Great recipe! I loved the lemony flavor even though my kids didn't. 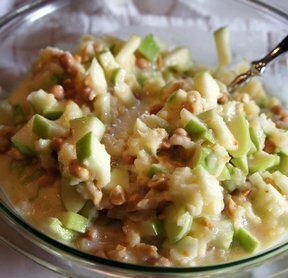 I didn't have any pine nuts so I used toasted slivered almonds." "Great salad. 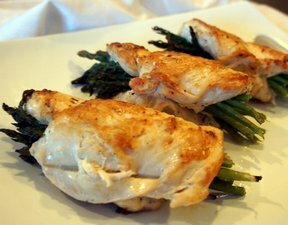 I grilled some asparagus and corn to add to the salad along with pepperjack cheese." "I give this 10 stars! I thought these were so good! And the little I had leftover made a delicious chicken fajita salad the next day. 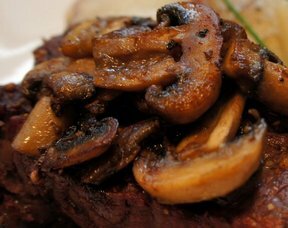 I added sauteed mushrooms, too." "I loved these. 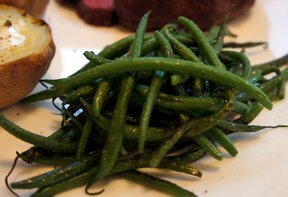 I used haricot verts from the Farmers Market. 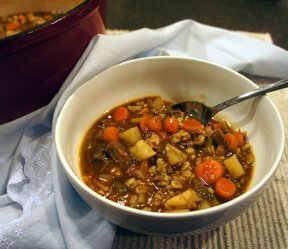 The chicken broth gives it a little more than just water." 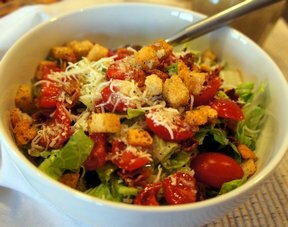 "This is the salad you need to make! 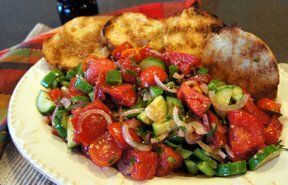 I cubed the bread and baked in the oven to crisp since I like the bread mixed in with the salad on a panzanella. It doesn't keep as well this way thought, but no worries since there won't be any leftover!" "Delicious! 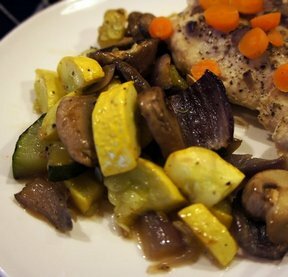 I made some slight modifications...I used ground chicken and leftover roasted vegetables (zucchini, onions, mushrooms). The vegetables keep the burger moist. Even my husband liked it and he is not a poultry fan." "Terrific! 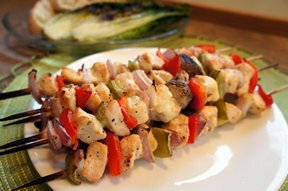 My husband liked them way better than my normal kabobs marinated in Italian dressing. Next time I'm going to add mushrooms, they'd be great with the marinade." "Ooh, this was delicious. I picked up some cherry tomatoes, zucchini and summer squash from the Farmers market. 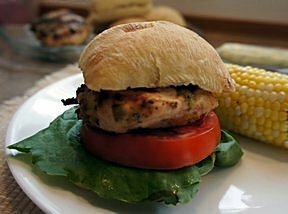 This was a quick and easy summer meal...with NO leftovers. I think next time I might try a little wweet corn in it." 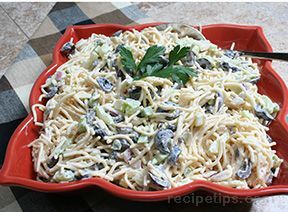 "The mushrooms and chicken are always my favorites. 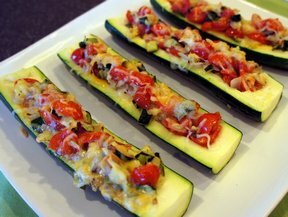 I like to add yellow squash and zucchini, too. 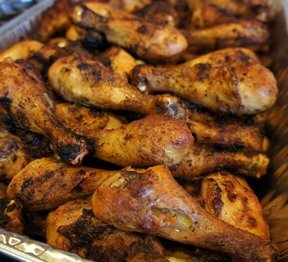 This marinade really keeps the chicken moist. 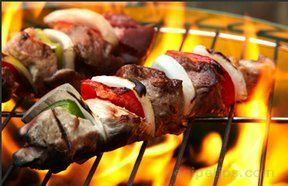 I had issues with my grill, so I finished them off in the oven on broil, and they were still delicious." 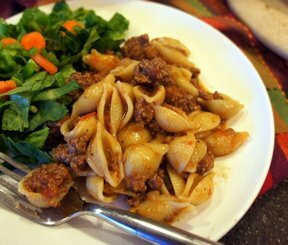 "I halved this recipe since I only had 1 pound of ground turkey. It was terrific. The kids like it too, which is always a bonus." "Great recipe. 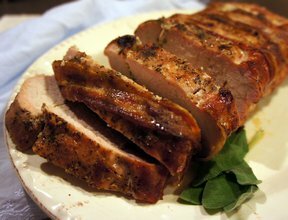 The longer you marinate the better - I did it overnight and they were full of flavor. I think fresh ginger would be the only thing I would change instead of the ground ginger next time." 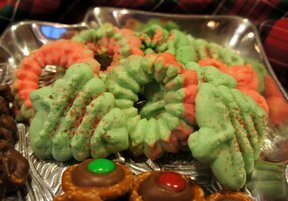 "My sister brings these for the holidays and everyone loves them. Now I can make them, too. Thanks!" "Something about chopped black olives that add so much. And I am not even a fan of black olives! 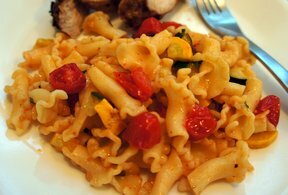 Great pasta recipe to use what you have in the refrigerator." 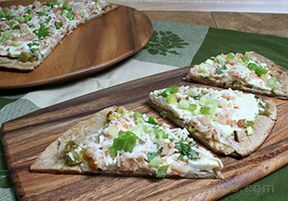 "Great way to kick off the grilling season! 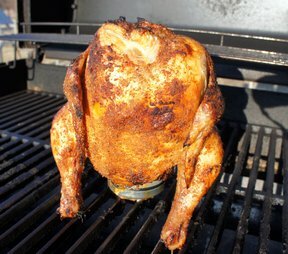 I was scared to use all the rub it made, but trusted the recipe and the flavor was sensational! 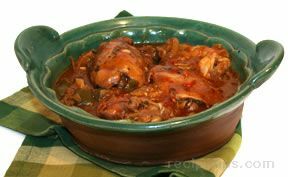 Chicken was moist and tender and I followed the recipe exactly." "Delicious! 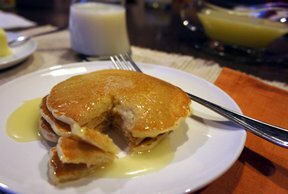 Who would have thought that this syrup would be better than maple syrup? But it is! Sweet and creamy. My husband even loved it." "Good flavor but could use a little sauce. 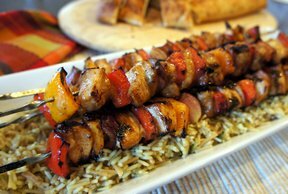 We used barbecue, but a sweet and sour would be really good to give it some asian flavor. 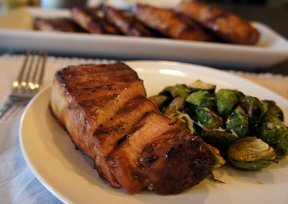 A little sesame oil stirred in with the butter might enhance the sesame flavor too; I will try that next time." "Not sure if it was the sweet potatoes or the cream, but possibly the best scalloped potatoes I've ever had. I omitted the rosemary, but stuck to the recipe for everything else." 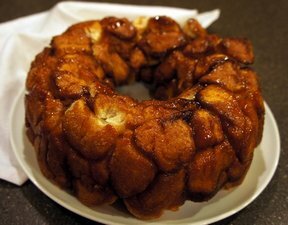 "The best Monkey bread yet! 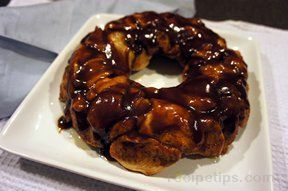 I thought it would be too much cinnamon, but the sauce was dark and rich and delicious. I was also scared there wouldn't be much bread, but the bread rose in the oven and there was plenty." "Good flavor. I added more salt and pepper. I think crushed tomatoes would be a great addition to thicken it up. Served it with grilled cheese. Kids liked it." "This was OK. Good flavor but a little too cheesy for me. 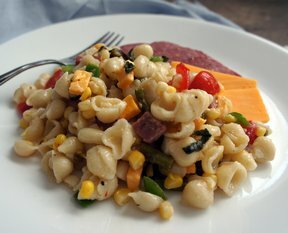 I would use less Velveeta next time, like 3/4 of a small pkg instead and more milk." "This is a good hotdish. My kids liked it when the stuffing was crunchy. I added celery for a little more veggies. I will make it again for a week night meal." "Well worth the effort! 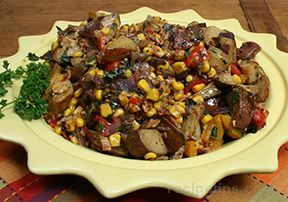 The grilled veggies add such great flavor and the dressing isn't mayo based, so it works better at picnics and potlucks. 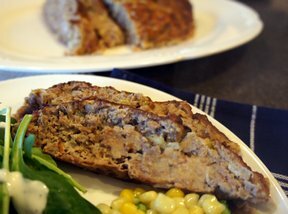 I used leftover sweet corn that I had cut off the cob." "And the best part is you can make it a day or so in advance and bake it off later! I like to make it the night before and then have it ready to throw in the oven when guests start arriving. I like the bacon idea and will try that next time." 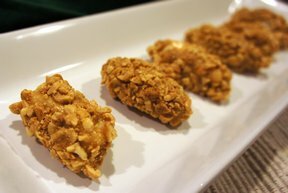 "It doesn't get any easier than this recipe! The meat just falls off the bones when it's ready. Delicious." "I omitted the onion and added taco seasoning with the ground beef. It was delicious. It had a little spice to it but not too much. Everyone loved it." 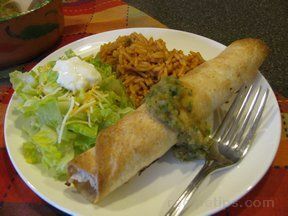 "I used flour tortillas since I had trouble with rolling the corn ones without them breaking and baked them in a 400 degree oven to save a few calories. I sprayed them with cooking spray before baking. Very good! Kids loved them." "My husband loved this! Made it as is except kept it in a warm oven until ready to eat." "These are really good! Very important to pre-cook the bacon a little so it will crisp without the cream cheese topping burning. These are very mild with all the seeds removed. 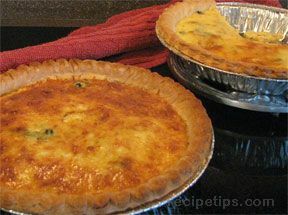 I will mix some into the cream cheese mixture next time to spice it up." "Absolutely delicious. I had a 9 lb rib roast with the bones tied on and it turned out perfect. And so easy!" "I made this into a meal by adding chicken. My picky 10-yr old had seconds and that's something!" 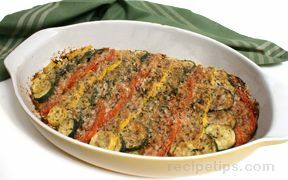 "With the exception of the Beau Monde seasoning, followed the recipe to the letter and it was delicious. Served it with a baked sandwich. Even the kids liked it." 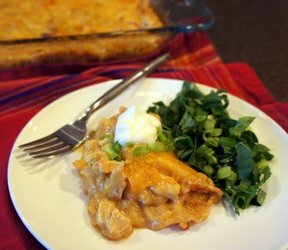 "One of my favorite fall dishes. Tons of flavor and a great way to use your garden items." 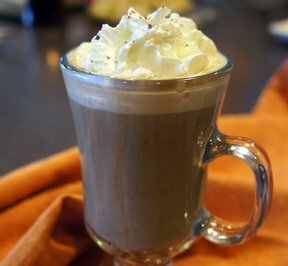 "A little sweeter than I prefer so I cut the sugar down to 1/2 to 2/3 cup. 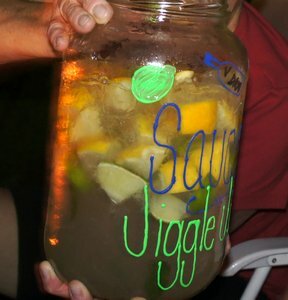 As with the Jiggle Juice, you can usually get 2 rounds with the same fruit." "To make it kid-friendly, use water instead of vodka. Also, you can usually get 2 rounds with the same fruit." "I omitted the milk and it was still delicious. So easy to prepare! I had to break apart the ice cream after adding the soda but I think it was because I didn't let them thaw enough." 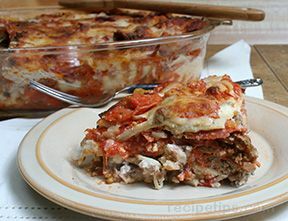 "I doubled and put in a large lasagna pan. At first I thought the bottom wasn't done due to looking a little eggy but after tasting it realized it was done and just deliciously custardy. 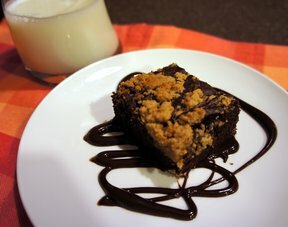 All my guests enjoyed, even the kids liked the pecan topping." 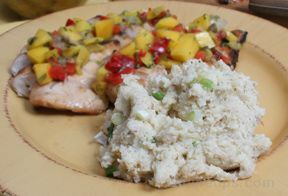 "Easy weeknight meal. 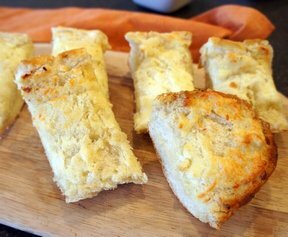 My husband loved the biscuits with the cornmeal on them. My daughters helped put it all together, too. 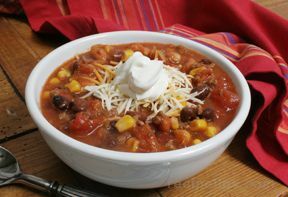 I added peas instead of the kidney beans." 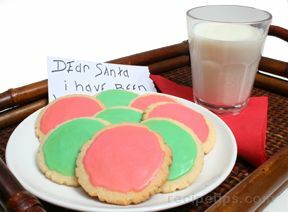 "My 7 yr-old couldn't get enough of these cookies. She loved them! So moist!" "Brought this to xmas and it was a hit. Chicken In a Biscuit crackers seemed to be the preferred dipper!" 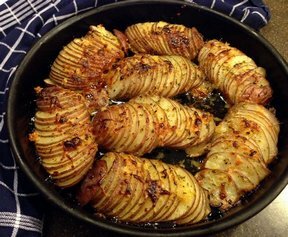 "Very good recipe. 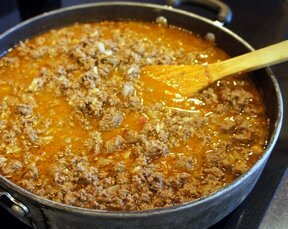 I made a few changes by using ground pork instead of beef, one can of chili beans instead of the 2 cans of other beans and only half the tomato juice. We topped with green onions, too. My kids loved the flavor!" "Very tasty. 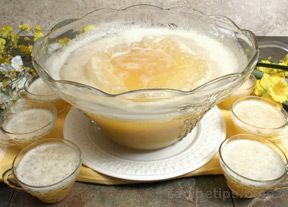 I used beef broth instead of water and regular horseradish, but decreased to 2 T. My kids ate it up." "Delicious! 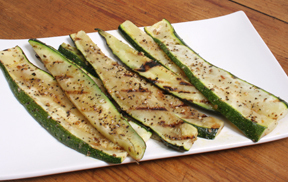 The grill just brings on a whole new life to zucchini. Don't be shy with the grill seasoning, either." 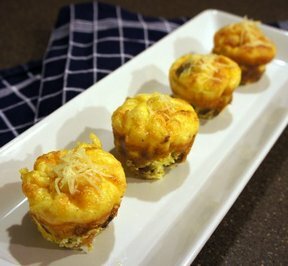 "These are so easy to make and my husband and kids devoured them. 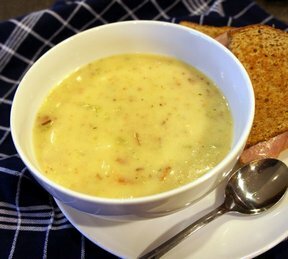 Served with a dollop of sour cream with chives!" "Yummy! Used cilantro for the salsa rather than basil. 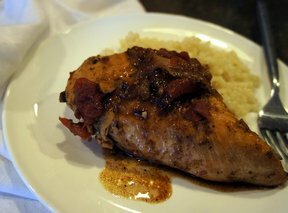 Chicken stayed moist even though I think I overcooked it." "I made this for a birthday party and all the kids loved it. It was gone and they asked for more. My nieces even asked for the recipe." 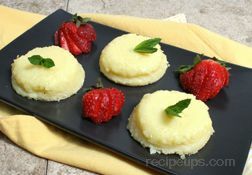 "Nice and light dessert with a mellow lemon flavor. The crust is almost like a shortbread cookie." Comment: I don't recommend making this with the fat-free, sugar-free pudding. It still tasted delicious, but didn't thicken as it did the last time I made it with the normal pudding mix. 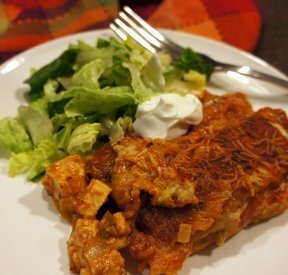 "My husband loved this recipe! He didn't even put it on anything. 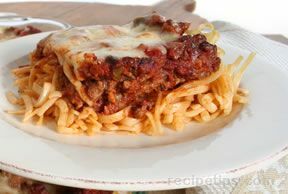 I agree with 2Tmom that it was a bit tangy, but still very good." "Nice flavor. 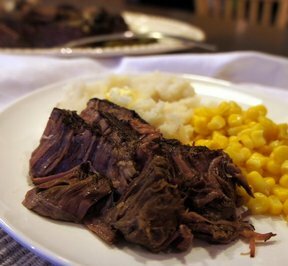 Texture isn't like mashed potatoes due to the roasting, but still a very good alternative." "Time consuming but well worth the wait. I took the core out of the cabbage and boiled the whole head for 5-6 minutes since I struggled getting the leaves off without tearing. Plenty of sauce leftover and used a 9x13 pan. Recommend a pan on a lower rack to catch any drips." 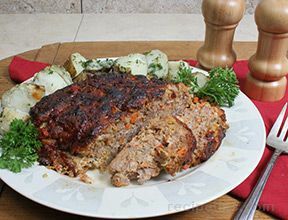 "I'm always looking for a good meatloaf recipe and this one is really good. My husband asked what the secret sauce was on top! I used cilantro instead of parsley." "Delicious. I browned the roast on all sides before putting in the crock pot. Even better the next day." "Tastes just like a slice of pizza." "I made these for xmas and they were gone in an instant. Very good." 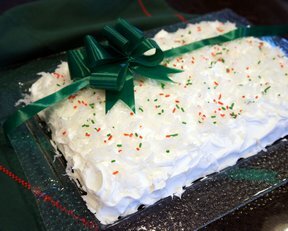 "I made this for a potluck and it didn't make it through the line." 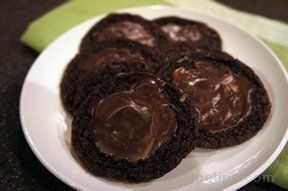 "Similar to a Girl Scout Tag-a-long cookie. I have also seen it made with Wheat Thins." "Yummy! 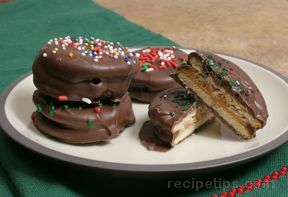 I will be making these for the holidays. I might add some M&M's for color." "These are my favorite sugar cookies!" "Instead of pepermint extract I would use almond extract. Maybe even add a little in the batter." "Delicious. 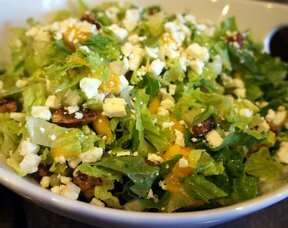 The pistachios mixed with the craisins definitely make this salad!" "Delicious! I can never find the peppercorn ranch so I use Sour Cream & onion chips. My mom isn't a mustard fan, but can't get enough of the honey mustard sauce. 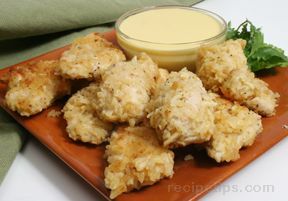 I sometimes make just the sauce and serve with the frozen nuggets when I don't have much time." "This is a hit at my house. 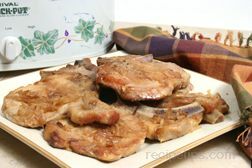 After browning the pork chops, I brown the onions for a few minutes to get them carmelized a bit." "Delicious. 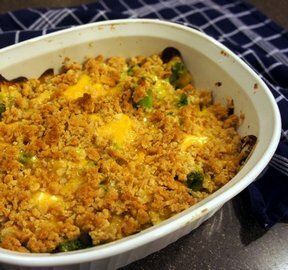 I made this but didn't refrigerate it overnight before adding the vegetables." 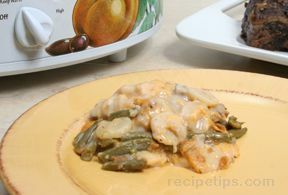 "I made these for Thanksgiving but used frozen green beans instead of canned. Worked great as there wasn't any room in the oven. Many comments on liking the crunch of the water chesnuts for a change in pace." 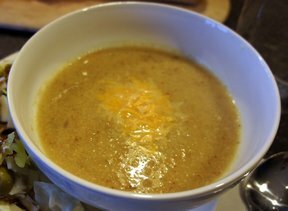 "This is a great alternative to a holiday meal when you are serving a small crowd." "These were really good - lots of flavor. I think cucumbers would be good in them too." 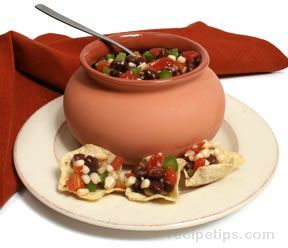 "I used black eyed peas instead of black beans. I also added cilantro and jalapeno." 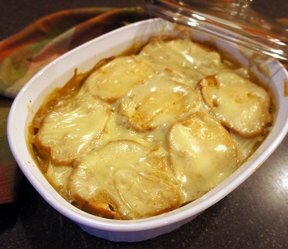 "You just can't go wrong with cheesy potatoes. This is a perfect side to serve for company." 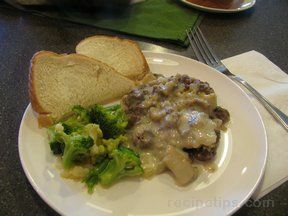 "I added mushrooms to the onions and celery. Very tasty." 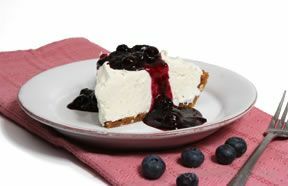 "I love cheesecake and this is even better since it doesn't have to be baked. So smooth and creamy." "This was very good. 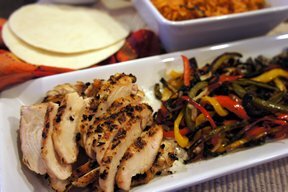 I didn't use the whole chile pepper so my kids would still eat it and it still gave it a little kick." "The chicken was so tender and tasty." "Rich and gooey. 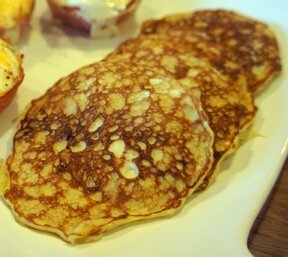 They were especially good when still warm." 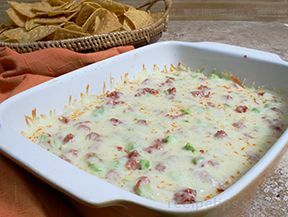 "This dip is delicious and so easy to make. 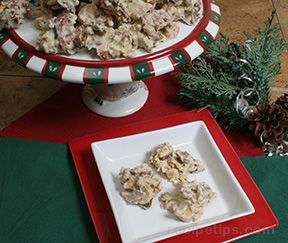 I brought it to xmas last year and everyone wanted the recipe." "This is so creamy and delicious. Worth the added work by using a real pumpkin. Delicious!" "This is so easy to throw together and its gone in no time. Perfect for a school party." 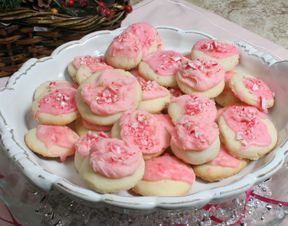 "These cookies are so cute. My kids loved them! They would even be cute for Christmas." Comment: This sounds like a great recipe with ingredients I usually have on hand. I bet my kids would love it. 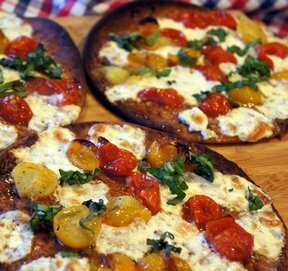 "This is very easy to make and grilling the pizza gives it a great taste, along with creating a crisp crust." "These are so delicious. My husband loves them." "I keep these in the freezer for unexpected company." "Delicious! 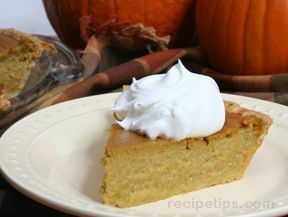 Just enough pumpkin flavor but not overwhelming."